What's the most difficult part? 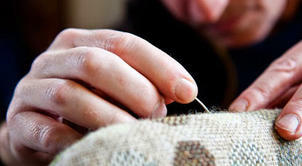 We are the artisans, so we are creative all the time. It can be technical when we have to make something from scratch but still creative. It is very difficult to say how much of it is creative and how much is technical. I think I can say that every job is technical and creative. If you have no technical experience you will not be able to do the job. If you don't have imagination and passion you can't be creative. This is so important in upholstery industry. My clients like to leave it to me to make sure the job is done as best as it can be. I always ask them what they like and don't like, to make sure I don't do anything that they’ll hate. I can propose something to them, show them how it will look and measure all the sizes to make sure it will look the best it possibly can in their home. I have a big collection of fabric, leathers and faux leathers, so they have the biggest range of colours and texture to choose from. 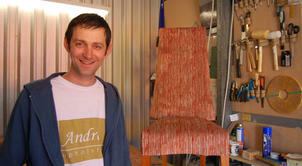 I thing I'm an ‘upholsteroholic’! I like all jobs. I can't tell anyone that I will do it but I don't like it. Every job is important to us. People are paying with money that they have worked hard for, not potatoes! If you fancy yourself appearing on DIY TV programmes and transforming broken sofas, have a look at the full range of upholstery courses available and find the perfect one to start a new hobby or even transform your career. Are these the strangest sofas of all time?